It’s entirely possible to get a delicious dinner on the table quickly. The key is to do a little prep work ahead of time and choose the right ingredients. 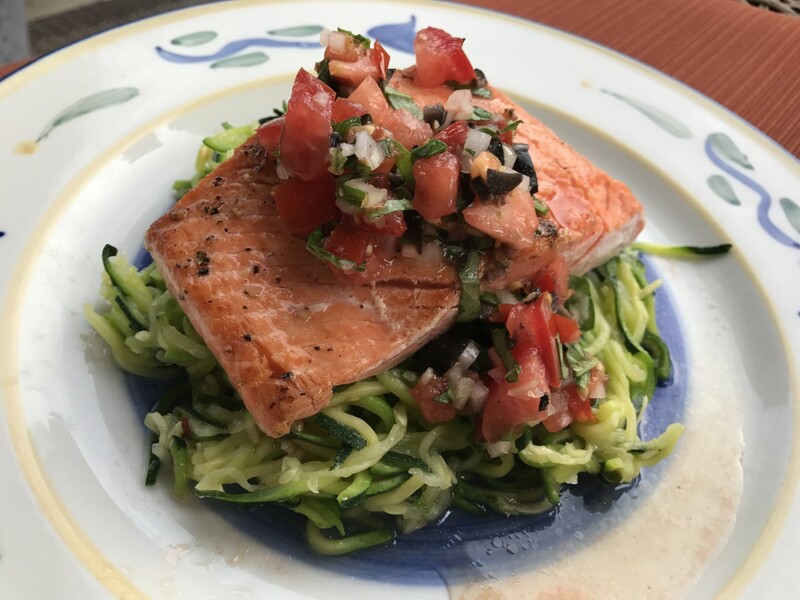 Salmon and zoodles both take very little time to cook and the flavors of this dish are hearty and bold while staying light and refreshing for a hot summer day. It was so good that I kept saying “mmmm….” after nearly every bite. I used my Spiralizer to make the zoodles the other day and salted them in a colander for about 20 minutes to get rid of most of the water. Once rinsed, I popped them in a container and stuck them in the fridge for tonight. I got home from yoga and was able to have dinner on the table in about 20 minutes. It might have been even faster if I’d been focused instead of chatting and taking notes for the recipe. I have to admit that I struggled with what to call this. I decided on Bruschetta Salmon because the topping is kind of like what you’d put on bruschetta but technically, “bruschetta” is the grilled bread rubbed with garlic and olive oil and the topping can vary. I thought about calling it Italian Salsa but that seemed equally confusing. Anyway, no matter what you call it, it’s still delicious. But if you plan on kissing anyone, make sure they have some too! 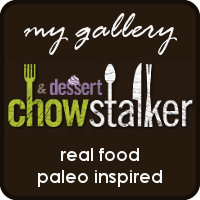 Seriously, though, this is the type of recipe to have in your back pocket for those rushed days when you still want to take care of yourself and celebrate the joy of eating healthy, fabulous food. Quantities are flexible here too. Use more or less tomato or garlic, or use parsley instead of basil. You get the idea. It will still be good. Just get in the kitchen and spoil yourself! Make the topping by chopping the tomato into 1/4 inch pieces and adding to a bowl with the garlic, olives, onion, basil, vinegar and oil. Add salt and pepper to taste and set aside. Melt the coconut oil in a pan over medium heat. Salt and pepper the salmon and lay face down (skin-side up) in the pan. Cook for 4 minutes and check to make sure the flesh is crispy and brown. Flip and cook skin-side down for another minute or 2, depending on the thickness of the fish. Once the salmon is just cooked through, remove to a plate, leaving the skin behind in the pan. Spiralize the zucchini and place in a colander over the sink. Salt liberally and mix through. Leave to drain for about 20 minutes. Warm the olive oil over low heat for a few minutes. Add the pepper flakes and garlic to the oil and allow to sizzle for about a minute until fragrant. Increase the heat to medium and add the zoodles. Toss the zoodles until evenly coated in the garlic oil and cooked, about 2 minutes. Taste and adjust seasonings and plate. Add 1/2 the bruschetta topping to each serving. Celebrate the freshness of summer!